Dental cleanings are incredibly beneficial, which is why insurance plans almost always cover them. Regular cleanings and checkups are the best way to avoid cavities and to help your natural teeth last a lifetime. Schedule your regular cleaning today by booking an appointment online or calling Lynn Griebahn, DDS, at Main Family Dental Care in Davenport, Iowa. First, expect an exam. Your Main Family Dental Care professional looks at your teeth, visually inspecting them and assessing your gums, looking for any can't-miss issues. X-rays may be considered if you're due for them. After X-rays, the actual cleaning process starts. The dentist or hygienist will use a small instrument, called a scaler, to remove tartar and plaque from your teeth. This part may go quickly, or it may take some time. It depends on how much plaque and tartar buildup you have. After the plaque and tartar have been carefully scraped from your teeth, the hygienist or dentist uses a unique, high-powered brush and polishing toothpaste to brush your teeth thoroughly. After the brushing, you receive a professional flossing. Lastly, you might receive a fluoride treatment to help protect your oral health until your next appointment. How often should I go to the dentist for a teeth cleaning? Your dental cleaning frequency is unique to you. The usual recommendation is twice a year, but people with specific dental problems may need to schedule more frequent cleanings. The American Dental Association recommends discussing your personal dental cleaning needs with your dentist. 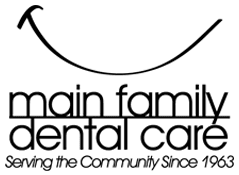 Even with routine procedures like dental cleanings, consulting with the dental experts at Main Family Dental Care about your particular situation is critical to receiving outstanding care. Circumstances and situations are different for everyone, especially when it comes to health. The best way to get care for you is not to follow a plan designed for an average person, but rather to follow one developed specifically for you. Oral health and overall health are closely related. Given that your mouth is connected to the rest of your body, oral health is essential to good health. Kidney disease, diabetes, heart health, and other conditions have also been linked to poor oral health. Regular dental cleanings, checkups, and conversations with your dentist are an integral part of maintaining good health. If you can't remember the last time you had your teeth professionally cleaned, book an appointment online or call Main Family Dental Care today.